Baden Elite series balls have been consistently rated with the highest marks by the users. The reason behind it is simple: it’s a ball made by a company listening to the players’ feedback. Not to say that the competitors don’t do the same, but Baden really took it to another level with Elite series. 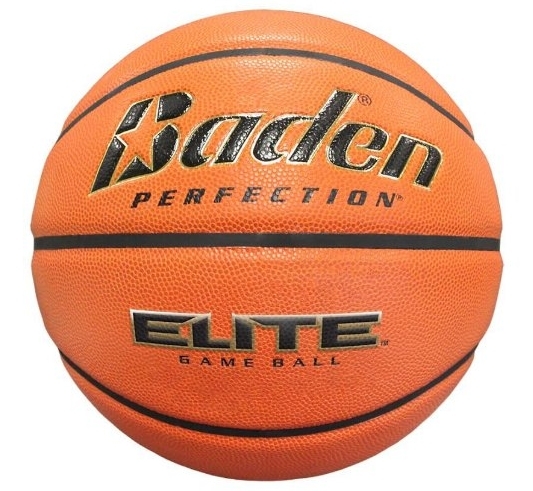 We tested Baden Perfection Elite game ball in sizes 6 and 7 and tried to establish if this model justifies the 4.9 star user rating. One thing worth mentioning is that this model is for indoor use only. Usually, a ball intended for indoor use can hold up well outdoors, but with this model, it is not recommended. When used outdoors, Elite series shows more wear and tear than the competition mostly due to its cushion technology. The good side is that this ball has a really soft bounce and an amazing feel to it. What we found unbelievably satisfying is the catch feel on all types of passes. Whether it’s a fast direct pass or a slow bounce pass, this ball always ends up where you expect it to. The optimum grip is achieved with the use of microfiber cover patented by Baden. We were especially impressed with the levels of control this ball has when it comes to a rhythm change. One other thing we were quite surprised by was the symmetrical design. Divide this ball any way you want and the design pattern of moist channels is perfectly symmetrical on both sides. This really helps with the dribbling and shooting as the grip is always the same. This is without a doubt a quality basketball, but we struggled to figure out why exactly is this model so popular among pro and amateur basketball players. And it wasn’t until the end of our test that we realized it: you make more shots with this ball. It sounds a bit silly when said outright, but this basketball really was more accurate that the others we tested. Or rather I should say, we were more accurate with it. We later figured out it as to do with the cushion technology. When you hit the rim, Elite series balls bounce just a little bit softer than the other balls, but that tiny amount proved to be enough to up our shooting percentage by as much as 2%. The overall quality of the Baden Elite series is undeniable. Considering the price range and the intended use, this ball is definitely a smart buy and an NFHS approval only confirms our opinion.